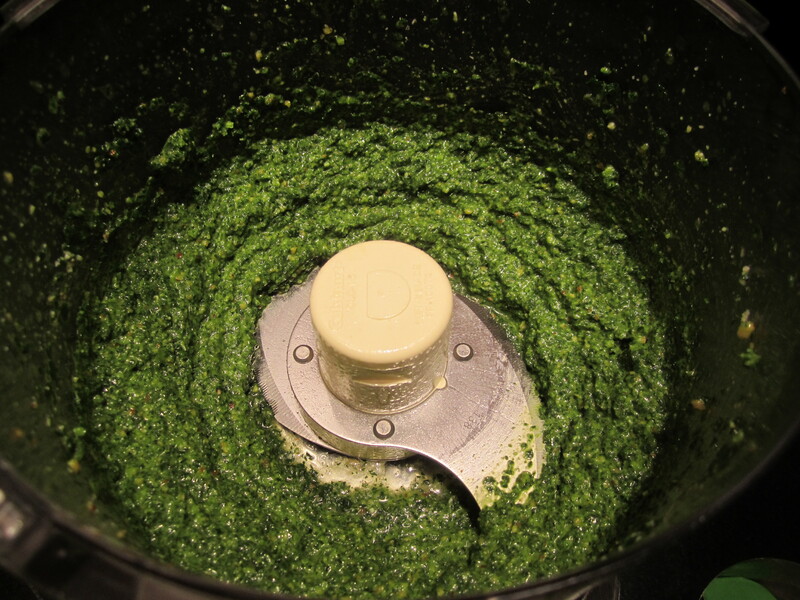 Outside of traditional basil pesto alla genovese, this is my favorite pesto. There is something unique about the texture and mild flavor of tuscan kale that lends itself to pesto. I’ve been buying it every week from my farmers’ market, and whevener I cook a bunch of it, I always hold some aside for making pesto. 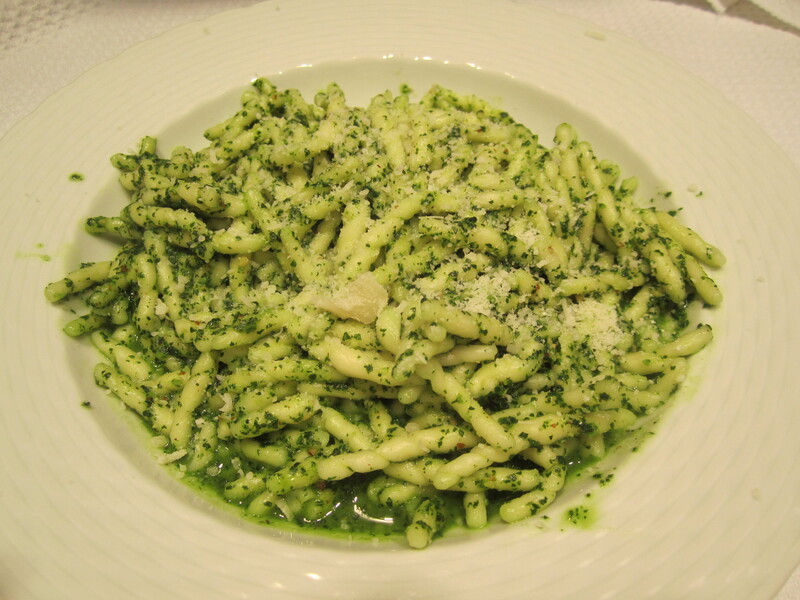 This pesto offers a couple of advantages over traditional basil pesto. For one, it can be heated in a saucepan prior to serving. Because of its sturdiness and the fact that it’s been blanched, it won’t blacken the way raw basil leaves do when ground and exposed to the air. To me, these two factors make this pesto an ideal dish to serve to guests (no racing to dress the pasta and get it on the table before it turns luke-warm and the pesto turns brown). 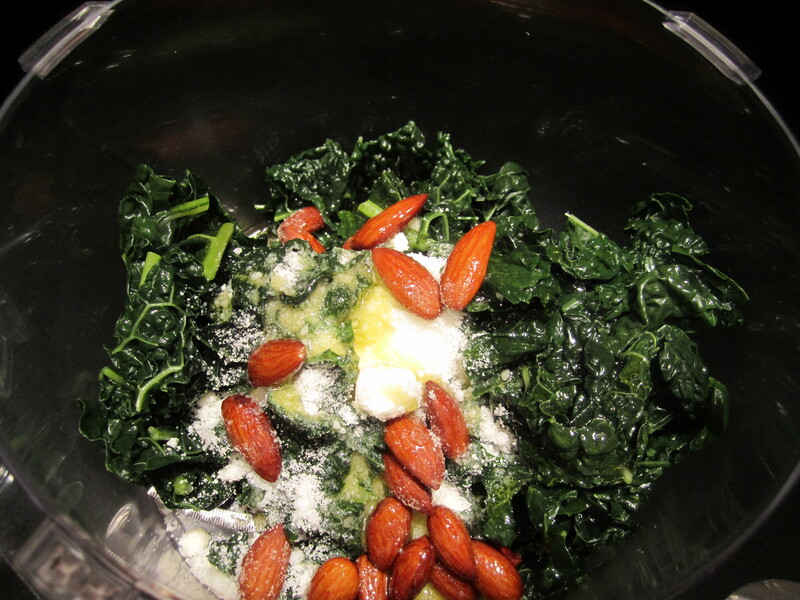 Because the cooked kale is much milder than raw basil, I like to use stronger ingredients to accompany it. I use smoked almonds instead of pine nuts (although roasted salted almonds are fine as well) and grated pecorino only (no parmigiano necessary to temper the strength and saltiness of the pecorino). 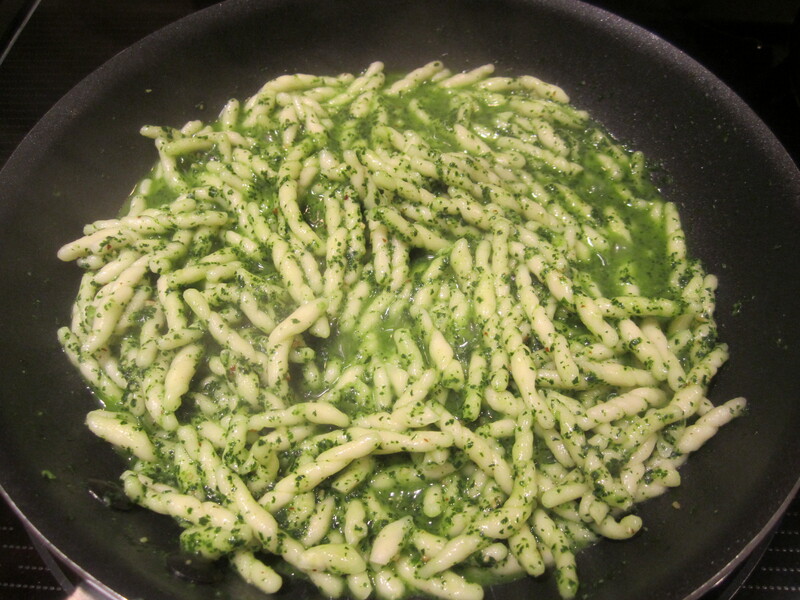 I add black pepper to this pesto, whereas I do not add it to basil pesto. Garlic lovers may want to add a fraction of a clove of garlic, although I choose not to add garlic because I like the flavor of the sauce without it (much cleaner and no lingering pungency on the palette). 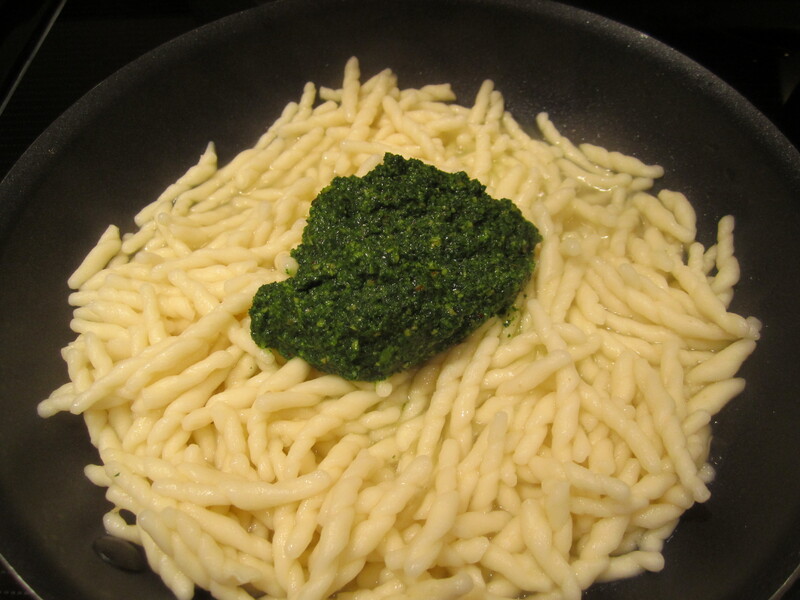 After the pasta is cooked, I transfer it to a skillet with a touch of broth and stir in the pesto–copious amounts of it. I simmer for a minute on low heat to combine, then serve. 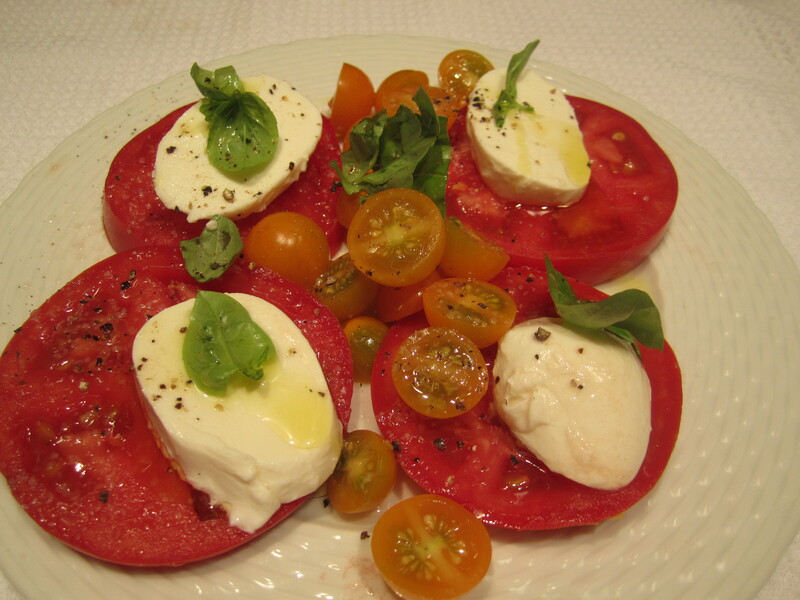 As a first course, I served tomato, mozzarella and basil, with my beautiful Florida tomatoes. I’m not sure how many photos of caprese salad I’ve posted in the course of this journal, but I have one almost daily, and each day I think–this is the best thing I’ve ever eaten! To dress pasta, add cooked pasta to skillet containing a 1/2 cup of chicken broth and bring to a simmer. Top with pesto. Stir, simmer for a minute, then serve with plenty of grated pecorino.